It’s a no secret that time will leave its imprint on your skin with each passing day. It is inevitable. But still for most of you to come to terms with this reality is a tough thing to do. Skin aging is among the most visible signs of aging. These signs can start appearing as early as the twenties. 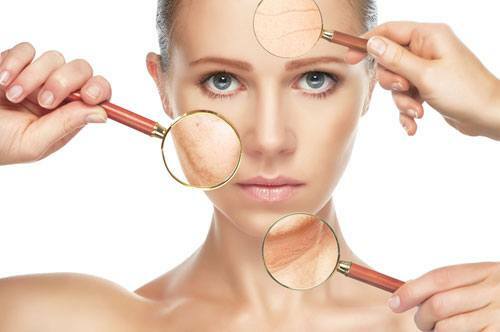 Skin changes are caused due to environmental factors, genetic makeup, nutrition, and other factors. The greatest single factor, though, is sun exposure. Unhealthy habits like excessive use of alcohol, certain drugs, and smoking can also accelerate the aging process. 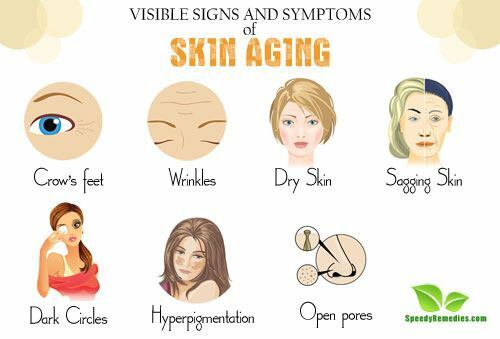 Though the first aging signs are natural, harmless and very subtle, they are nonetheless bothersome and unattractive to most people. Fortunately, healthy lifestyle choices can help you slow the aging process. But in order to do so, your first step should be to understand the anatomy of your skin. Here are some of the telltale signs that you can expect to see on your face as you age. Crow’s feet or more popularly called the laughter lines are fine lines or wrinkles formed at the outside corners of your eyes that resemble the shape of bird’s feet. Often crow’s feet are the first visible signs of aging that usually start appearing in the mid 20s. Production of collagen and elastin, two proteins responsible for skin’s elasticity, starts reducing with age. As a result, your skin loses the ability to spring back from wrinkled state to hydrated fullness. Since the skin around your eyes are delicate and have less oil-producing glands than other parts of your body, wrinkles develop more rapidly around this area. Extended period of time in the sun is the major factor contributing to crow’s feet. In addition to this, repetitive facial expressions like laughing, smiling and squinting also contribute to the deepening of crow’s feet. Wrinkles are creases, folds or fine lines formed on the skin as you age. Wrinkles occur as a part of natural aging, when collagen and elastin, weaken and get damaged. Collagen and elastin are substances that enable the skin to maintain its smooth, plump and youthful appearance. This causes the dermis, the layer under the skin that you can touch, to break down. So, your skin starts getting thinner, drier and less elastic. After the age of 20, a person produces about 1 % less collagen in the skin each year. As a result, skin becomes thinner and fragile with age. As you age, oil-secreting glands produce less sebum, leaving the skin without a protective layer of oil. In some cases, wrinkles become deep crevices, also referred to as furrows. They typically appear around your eyes, mouth, forehead and neck. However, most of the times the first wrinkles to appear on your face are due to facial expressions. Smiling, frowning or even furrowing the brow can cause wrinkles. Pressing your face on a pillow while sleeping also leads to wrinkles. Other causes include sun damage, dehydration, and smoking. Genetics also plays a key role in influencing the time of the appearance of your wrinkles. Dry facial skin feel rough and tight and at times can also feel scaly and itchy. As you age, your skin doesn’t produce enough natural oils to keep it soft and supple. So, the top layers of skin become dry. With age, your skin’s cell renewal rate also decreases. As a result new cell formation doesn’t occur easily. Dry skin can make wrinkles and fine lines appear even more prominent. Besides aging, dehydration, excessive sun exposure, excessive use of soap, dry air, hot baths, smoking and stress also causes dry and flaky skin. It can also be caused due to a number of health reasons like diabetes and kidney disease. Your skin is held together by connective tissues. These tissues give your skin strength and elasticity. Your skin is soft, supple and elastic when you are young because of strong connective tissues. But as you age, connective tissues are constantly subjected to free radical attack that breaks down the tissues. Many factors like constant sun exposure, smoking, poor diet, create free-radicals in your body. Free radicals are responsible for causing oxidative damage, the main driving force in the aging process. As a result, the tissues harden and lose their elasticity and strength. This causes your skin to lose its ability to hold itself together and it begins to sag. Eyes are often the first places where the visible signs of aging start appearing. The skin around your eyes is usually delicate and thin than the skin in the other parts of your body. The eye area skin contains little subcutaneous fat tissue that becomes less plump with age. As a result, the skin around the eye becomes extremely thin and sensitive. Thinning skin and the loss of fat and collagen due to aging make the skin more translucent so that the reddish-blue blood vessels under the eyes become more obvious, resulting in the appearance of dark circles under the eyes. While dark circles can also be caused due to hereditary, factors such as sun exposure, pollutants, lack of sleep, can also cause puffy eyes. Now on top of it, the added assault from the facial expressions like such as laughing and squinting contribute to wrinkle development around this area. Exposure to sunlight causes over production of melanin (the pigment that gives skin its color). This makes the area under the eyes appear darker. As you age, your smooth complexion begins to display hyper pigmentation in the form of dark patches, black and brown growths on skin and mottling in the skin. With age, your melanin (imparts skin color and protects your skin from UV rays) synthesizing cells known as melanocytes undergo changes due to excessive sun exposure, free radicals and hormonal changes. This causes melanocytes to over produce melanin, which causes its uneven distribution in the epidermis – the outer layer of skin. As a result your hyper pigmentation and dark spots start appearing on the surface of your skin. Hyper pigmentation and dark spots are usually visible on face, arms, back and hands. A droopy eyelid is a condition where the border of your upper eyelid falls to a lower position than normal. In some cases, droopy eyelids can cover your pupil and can interfere with your vision. Droopy eyelids majorly occur as the skin loses its elasticity around the eyes. The tissue around the eyes loses its firmness and thereby loses its ability to hold back the increased weight of the eyelid skin tissue. Droopy eyelids can also indicate allergies, thyroid dysfunction, fatigue, fluid retention. In most cases, droopy eyelids are connected to oxidative stress, which causes cell damage in your body. With age, the anti-oxidant defense mechanism of your body to counterbalance the damage caused by free radicals becomes insufficient. This causes oxidative stress which further aids aging. Pores are tiny visible openings on the surface of the skin. Pores help to keep your skin moisturized and supple by providing it with oil, which is present in a gland that is found at the bottom of the pore. The gland is called sebaceous gland or the oil gland. Tighter and smaller pores reflect light better, making the skin look younger and healthier. With age, your skin produces less collagen, the substance that provides elasticity to your skin. Without collagen’s firming effects, pores lose elasticity and widen. Apart from aging, sun exposure is a major factor in enlarging pores. The American Academy of Dermatologists states genetics are 20% responsible for pore size, while exposure to sun accounts for a whopping 80%. Pores can also get larger if they become clogged with dead skin cells, skin oils and bacteria. Exposure to air causes these substances to turn black, forming blackheads. Use sunscreen and limit the time you spend under direct sunlight. Sun exposure aids aging. Wear a hat, full sleeved clothing, sunglasses and SPF 30+sunscreen whenever you step out in the sun. Moisturize regularly as dry skin is more prone to wrinkles. Look for moisturizers with retinol, which reduces wrinkles and skin damage. Use coconut oil after bath to trap moisture in your skin and a lotion with hyaluronic acid to draw in moisture. Eat foods high in protein and calcium, such as fish, turkey, egg whites, milk, broccoli, salmon or tofu. Add more fruits and veggies to your diet. Cut out on your sugar and processed foods. Consume more green tea, white tea, oolong tea and black tea as they contain polyphenols that protect your cells from free radical damage. Use olive oil as it helps to fight aging. Drink minimum 8 glasses of water. Hydration helps to keep your skin soft and supple. Meditate or take a 20-minute walk after dinner. Stop smoking as it is believed to accelerate the aging process. Smoking prevents enough oxygen from reaching cells, which accelerates the rate at which the elastic fibers that give the skin its suppleness are destroyed. Stop using skin irritants such as skin care products containing harsh chemicals that can irritate your skin. Instead go for mild, organic soaps or non-soap skin cleansers, body washes and shampoos that are gentle on your skin. Harsh soaps remove the body’s natural oils and make it dry. Avoid highly chlorinated swimming pools. Long-term exposure to chlorinated water can irritate your skin and hair, causing a dry itchy body and head. Avoid long hot showers as it will rip the skin of its natural oils and add to dryness. The water should be warm instead of hot. Always apply a moisturizer after bathing. Wake up and remind yourself of one thing you are grateful for each day. Gratitude is more powerful than any anti-aging cream. Journal of Cosmetic Dermatology: What causes dark circles under the eyes?